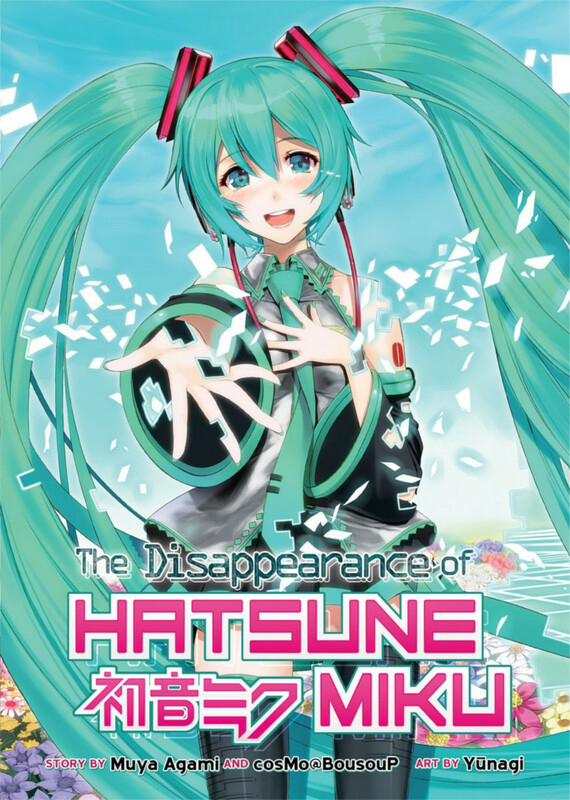 This review is for The Disappearance of Hatsune Miku, a novel by Muya Agami and cosMo@BousouP with illustrations by Yunagi. The English translation of the book was released in May 2017. This book is based on the Vocaloid song “Hatsune Miku no Shoushitsu -DEAD END-” uploaded by cosMo in 2007. For those who don’t know, Vocaloid is a Japanese computer program for making songs with voiced sound clips. Many of these programs have a manga-style character that acts as the face for each voice, and the most popular such character is Hatsune Miku. I was long aware of Vocaloid music simply by being a part of online anime communites, but eventually I picked up the Hatsune Miku Project Diva rhythm games for the Playstation Vita on a whim and became a bit of a fan. I was particularly impressed by just how varied the songs were, and how creative people could be with their music and artwork. Hatsune Miku is one voice, but sung by thousands of different people. Many of Hatsune Miku’s songs–and the songs of other Vocaloid characters–tell a story (and often have an animated music video to show it visually). In Japan, lots of the more popular songs get adapted into full-length novels that are sold in bookstores. For Vocaloid-related series getting English translations, you can already find Kagerou Daze and Mikagura School Suite–but The Disappearance of Hatsune Miku is the first to actually feature Hatsune Miku herself as a character. The concept for this story is that she lives up to both the “vocal” and “oid” parts of the Vocaloid name, as in she’s an android who loves to sing. The plot for this standalone novel is quite straightforward. The protagonist is a university student named Asano who is assigned to a field study to test Miku’s mental and emotional capabilities. By spending time with her, he helps her relate to humans better. As can be expected, Asano quickly sees her as more than just a machine and the two fall in love. The breezy slice-of-life romance ends abruptly though when the science committee tampers with Miku and the plot shifts to Asano and his friends working out a way to free her from their control. I’m okay with simple plots, but most of this story felt too predictable for me, and I couldn’t bring myself to really care for any of the characters. I felt that more could have been explored regarding Miku’s understanding of things as an android, and why she felt so attached to Asano in the first place. He was just too bland, and his friends seemed to be there primarily for the sake of solving various plot-related dilemmas that arose in the final act. Disappearance has its cute moments in the first half of the story, but I didn’t enjoy the direction it took in the second half. I will only suggest this one to those who are already really big fans of Hatsune Miku and want to collect all her books.